“Innovation” is an overused term. The smallest adjustments, the most trivial enhancements, and the least impactful improvements are often trumpeted as innovative. But every once in a while, something truly groundbreaking and transformative comes our way—disrupting longstanding assumptions and norms in the process. In the following pages, you’ll learn why applications are increasingly crucial to businesses (page 4). 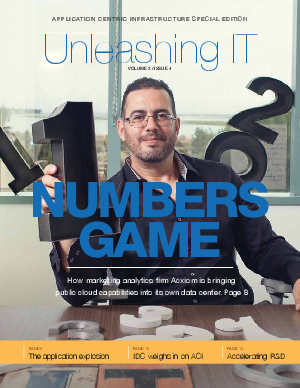 You’ll get unique perspectives from industry analysts and software automation visionaries (pages 10 and 15). and you’ll hear from companies that are already taking advantage of aCI, like acxiom (page 8), Netapp (page 12), and Symantec (page 14). aCI is an entirely new approach for how systems are built, automated, and administered; for how IT teams work together; and for how businesses will be pushed forward over the next decade. That’s what we call true innovation.